I don’t think that’s too much, but my perspective may be a little skewed. I admit, I’m a bit of a brush junkie. I’m always searching for that next high… the better blending brush, the softer kabuki. But I’m also frugal so I don’t necessarily go for the brand names or crazy Japanese artisan brushes (no Hakuhodo or Suqqu for me). 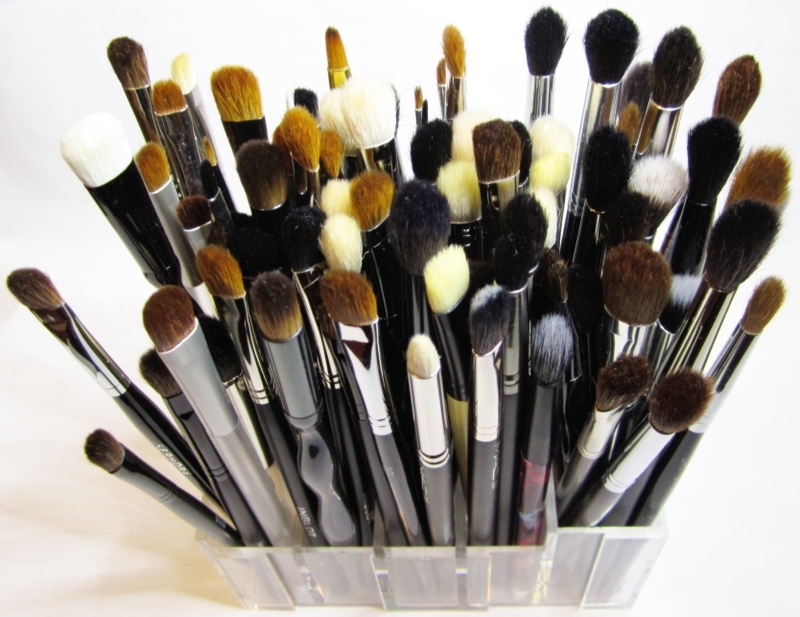 I’m not loyal to any one particular brand of brushes – there’s a good representation from across various brands including MAC, Coastal Scents, Trish McEvoy, Real Techniques, Smashbox, Ecotools, etc. My sweet spot for eye makeup brushes is no more than $20 per brush and face brushes I try to keep it to below $40. 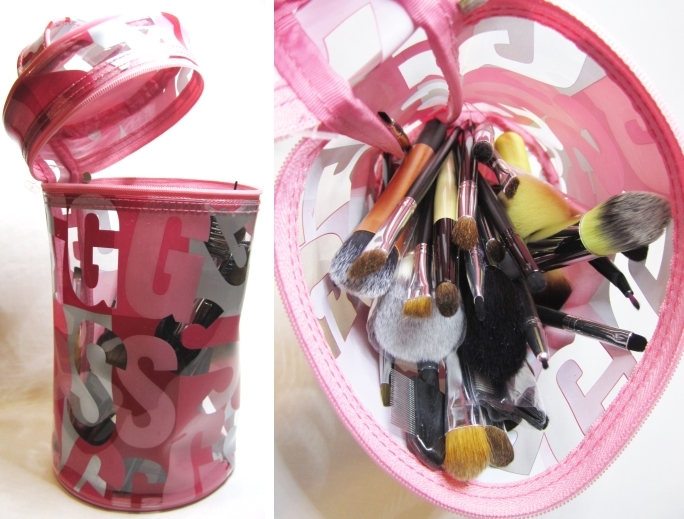 Kabuki brushes – I have duplicates / back-ups of these which I haven’t photographed. 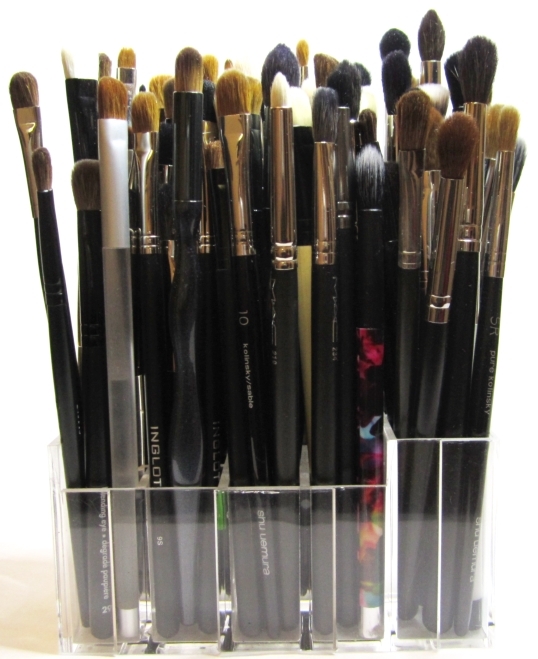 My double-ended or brushes with toppers that can’t stand upright – I keep them horizontal in this stackable acrylic tray. I rarely reach for these because I keep forgetting about them. 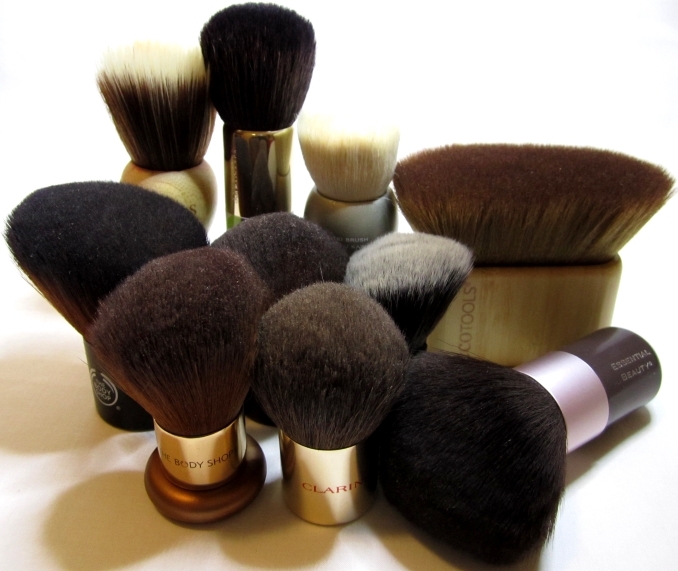 Foundation and bronzer brushes. I got this holder from Winners and it worked better in theory – in reality, it’s a little too large for what I need. 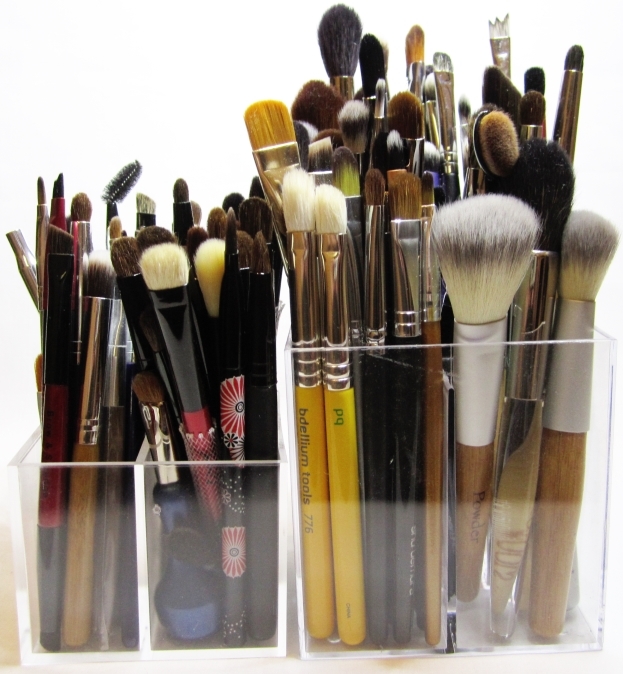 My dirty brushes – this is the designated cup to hold all my dirty brushes. Once it gets full, that’s the signal that I need to stop being so lazy and wash my brushes already. You’ve also probably heard it before – one of the reasons for collecting so many brushes is due to laziness. I like using clean eye brushes every time I do my eye makeup, but I get lazy about washing my brushes – solution: buy more brushes! 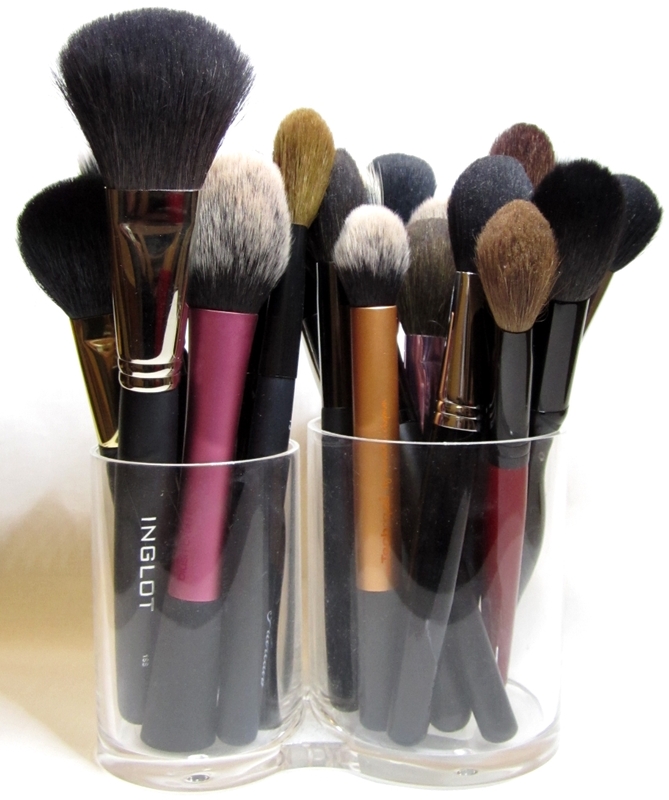 This also applies to foundation brushes – I use a foundation brush no more than 2 times before I wash it. Now with so many, I always have fresh ones on rotation. It’s simply labelled “02”. It’s the perfect density, softness, size, shape – everything – for applying powder eye shadow on my eye shape. For years I tried to find a dupe for this from other brands but nothing has been exact (I’ll devote an entry on this in the future). This is the one brush I would run back into a burning building to save. Make Up For Ever #122 Blending Brush, cost $55 (Sephora) – subjectively it’s also the softest feeling brush I own. It’s great for applying bronzers or powders that are either loose or tend to be soft and powdery in texture. EDIT: after I took all the photos and finished this entry, I realized my most expensive brush is actually the Nars Yachiyo Kabuki Brush at $65. Unfortunately, I hardly ever use that brush because it sheds and is so flimsy delicate that I feel like I’m going to break it. This brush is shown in the photo with the brushes for bronzing, highlighting, contouring – on the most left hand side. I got it at a grand opening of an art store – they were handing out free brushes and I believe this was meant for watercolour. I love this brush for applying eye inner corner highlight – it’s super soft but has good flex and it’s the perfect size for that area. I use this almost daily. Art brushes typically have longer handles than makeup brushes so I broke off the handle – rather poorly – I may try to mend it with some colourful washi tape. I’ve had this brush for more than 10 years and would be very sad if I ever misplaced it! There’s nothing intrinsically wrong with these brushes, I just prefer some others. Once I do a purge, I do have a few brushes on my wish list to acquire in the future, including: MAC 242 Shader, MUFE 154 Buffer brush, OCC #11 small powder blush brush, and Paula Dorf Sheer Crease brush. Yes, the quest is never ending! What about you? 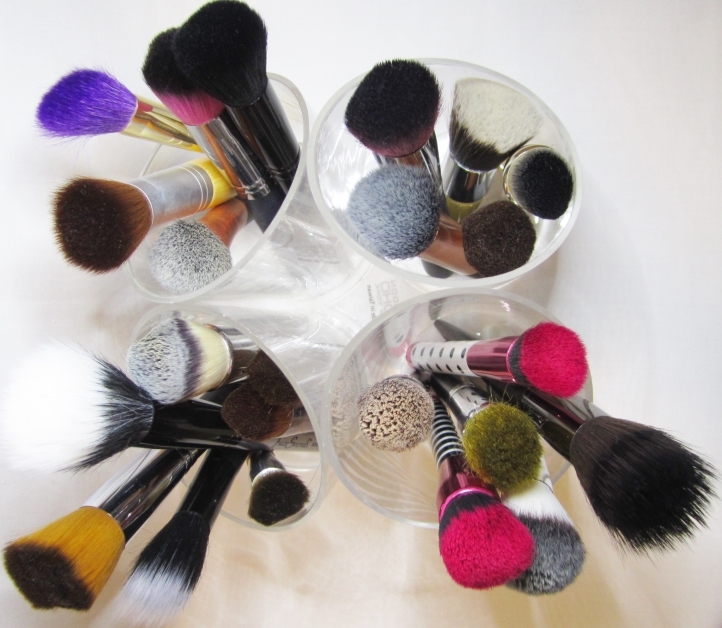 How many brushes do you own? What are your favourite brushes? Any brushes on your wish list? < Previous NEW Tag: The No Buy / Lo Buy Tag! reading this!! Your stash wins again! It’s not a good distinction though! I don’t post these stash entries to boast… it really is to give me some perspective on how much I truly own… even though I still want more brushes, lol. Lol I know you don’t I think it just give me an excuse to feel like I can buy more brushes! I think you’re my spirit animal. I hate washing brushes and I’ve always wanted to just buy new brushes instead and have a constant rotation. I like your style! Haha, so our spirit animal must be a squirrel since they like to hoard stuff in their den…! I know, I have issues. I am trying my hardest NOT to purchase any more this year! OMG Club Monaco brushes! I am still using my CM powder brush after all these years. I got it when CM were clearing out their makeup (sniff!) and I love it. And I loved that Monica Lewinsky Glaze lipstick. That eye brush looks great. 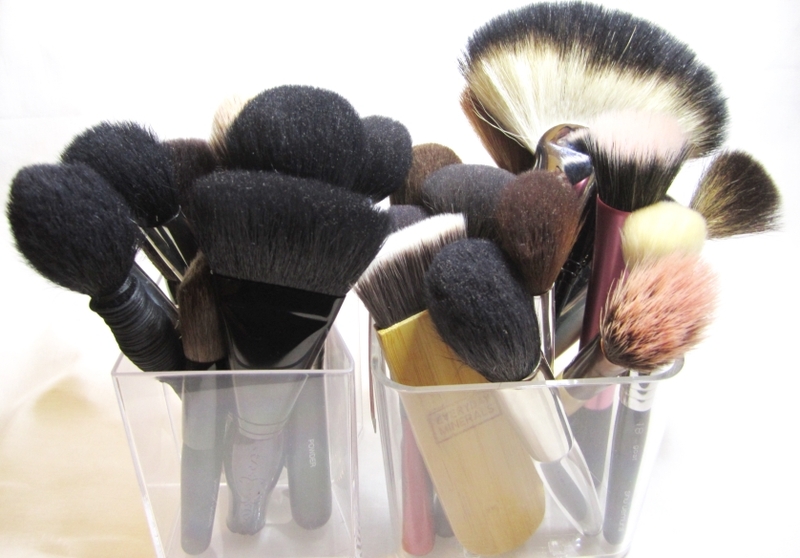 Your brush collection is awe-inspiring. Haha, yes, it was getting out of hand. I did purge a whole bunch last month, but I kept the Tokidoki and Hello Kitty. They were gifts and I love them! Your perspective is (hm) a ‘little’ skew. Just 200+ of eye brushes is sooooo few lol 😂 if you only use 7 brushes per day, you don’t need to wash for a month. Wahaha. Just teasing 😜 I’d imagine most professional makeup artist own less than you. 😂 actually will you do a review on all or best/worst sort of post? 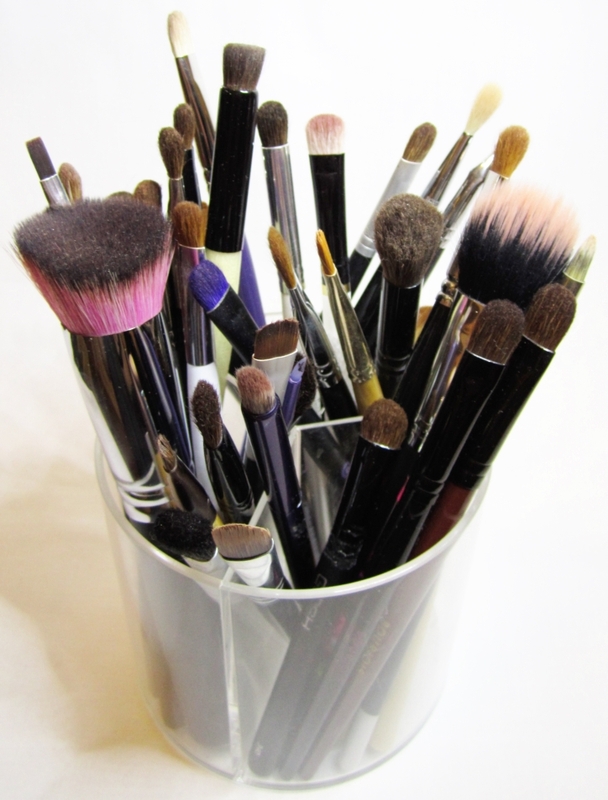 I haven’t done a best / worst type of post – I’ve probably purged the worst of my brushes by now! Wahaha 😂 o well, I’m sure you’ll acquire new ones to replace the purged ones.